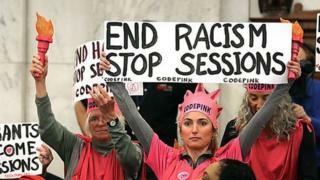 Three members of the the Code Pink activist group have been convicted on charges of disrupting Attorney General Jeff Sessions' confirmation hearing. Desiree Fairooz, one of the protesters who was found guilty, said all she did was laugh during the hearing. Ms Fairooz, 61, was found guilty on two charges of disorderly conduct and parading or demonstrating on Capitol grounds. Each protester could face up to 12 months in prison. Tighe Barry and Lenny Bianchi, who wore Ku Klux Klan (KKK) robes during the 10 January hearing, were also convicted on two separate charges of parading or demonstrating, according to US attorney spokesman Bill Miller. The two men were acquitted on charges of disrupting Congress. Ms Fairooz was removed and arrested after she interrupted Alabama Senator Richard Shelby during his opening statement at Mr Sessions' confirmation hearing to become America's top prosecutor. The interruption came when Mr Shelby said that Mr Sessions' record of "treating all Americans equally under the law is clear and well-documented". Ms Fairooz "let out aloud [sic] bursts of laughter, followed by a second louder burst of laughter", according to a court document. "I just couldn't hold it," the Virginia resident said on Wednesday. "It was spontaneous. It was an immediate rejection of what I considered an outright lie or pure ignorance." 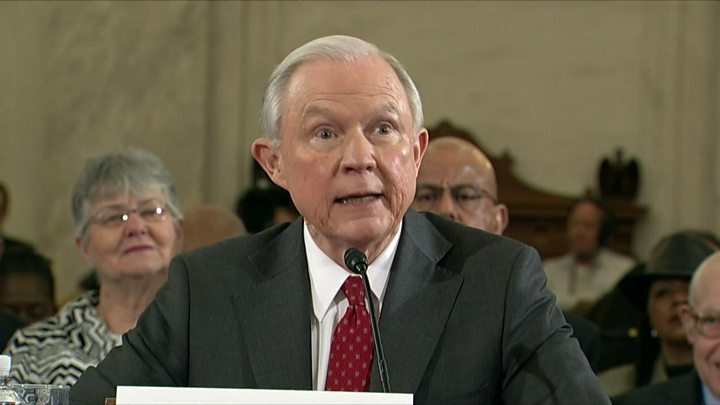 Mr Sessions faced public scrutiny during his confirmation over allegations that he had once supported the KKK and other charges of racism. Ms Fairooz added she did not intend to disrupt the hearing and did not plan to get arrested. "We just wanted to be a visible symbol of dissent." Code Pink campaign director Ariel Gold, who was sitting near Ms Fairooz, described the sound as a "reflexive gasp" that was "quieter than a cough". "I would barely call it a laugh," she said. Each protester faces up to six months in jail or a $1,000 (£776) fine, according to Mr Miller.